Mary Elizabeth Woolley Chamberlain was the first woman in the United States to be elected as mayor or president of a town board, with an all-woman board. Elected under the name Mary W. Howard, she served in Kanab from 1911 to 1913. The election was intended as a joke at the time, but the women garnered a lot of national attention. Susa Young Gates, came to Kanab and was enthusiastic about their work. 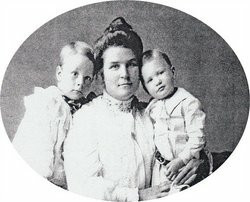 “She was then writing a book on what Utah women had accomplished and insisted that I write her all the details of our work.” The letter that Mary wrote was mailed in October 1913, and when Gates was out of town so the letter ended up in the hands of the editor of the Improvement Era and was published there in the July 1914. While in office, the women protected local merchants by increasing the license fee for peddlers and traveling salespeople. They passed ordinances for the regulation of stray animals, a dog tax, a law requiring residents to use "fly-traps," and the prohibition of "flippers and slings" within town limits to protect birds from thoughtless youth. The women also outlawed foot races, horse races, ball games, and all "noisy sports" on the Sabbath. And, in keeping with the national trend towards temperance, the female board made Kanab a "dry" community with a strict antiliquor ordinance. They arranged for the town cemetery to be surveyed and plotted, purchased lumber and had bridges built over town ditches, joined with Kanab's Irrigation Company and built a large dike to protect the town from flooding, and named September 12, 1912, as "Stink Weed Day" and awarded prizes of $10, $5, and $2.50 for the best cleanup jobs in town. Toward the end of their term, their supporters wanted them to run again, but Mary hoped that the town would go on voting for other women candidates. However, the 1914 mayor and council were all male. Chamberlain was the last of Thomas Chamberlain’s six wives. She was the mother of two sons. She also served as the first female clerk of Kane County. After her husband died in 1918, she supported herself by selling baked goods and as a traveling sales representative of silk knitwear. As a member of The Church of Jesus Christ of Latter-day Saints, she served in many callings. She also was active with the Daughters of the Utah Pioneers. She was born on 1870, in St. George, Utah, and died in 1953, in Pocatello, Idaho. This page was last edited on 1 February 2017, at 14:54.